We have selected some important nutritional tips that, combined with the proper exercise program, will bring great results to your health, and consequently a better body. 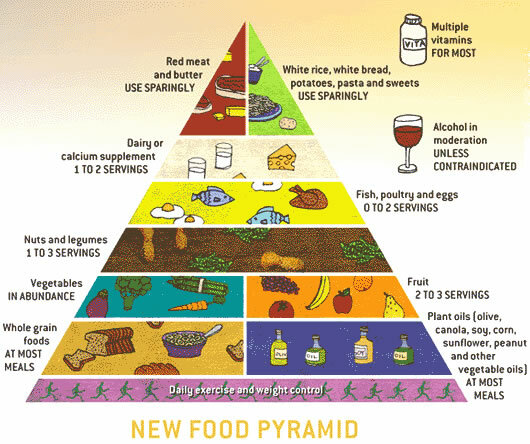 CHECK OUT THE FOOD PYRAMID! Red wines contain high levels of flavonoids which help protect against heart disease. They also prevent blood clotting and help increase “good” HDL blood cholesterol. At least one drink 5/6 times per week is recommended. Soy contain isoflavins which have been linked to reducing heart disease risk. It is also believed to reduce symptoms of menopause because of it’s estrogen mimicking effect. For these reasons, the American Heart Association recommends at least 25g of soy protein per day. Adequate hidration during physical activity is essential because muscle temperature rises and a lot of water is lost. It is importnat to be hidrated before, during, and after the workout. Workouts longer than 30 minutes willrequire a carbohydrate drink. Coconut water is rich in mineral salts, potassium and sodium. It is also a mild diuretic and is indicated for cases of diarria, vommiting, and dehydration. It is very effective in cases of high blood pressure, cramps, weak muscles, and illness. Above all this, it is an excellent sports drink. High in fiber and antioxidant vitamins beta-carotene and C, which help against heart disease, and rich in folate. Broccoli’s phytochemicals (glucosinolates) have important properties, especially against cancer. Avocados are a very good source of vitamin E and monounsataturated fats, and contain many other vitamins and minerals.